A self-declared Israeli Sanhedrin, a religious High Court composed of 71 sages, has demanded that Pope Francis apologise for recognising a separate Palestinian state or face trial next month. 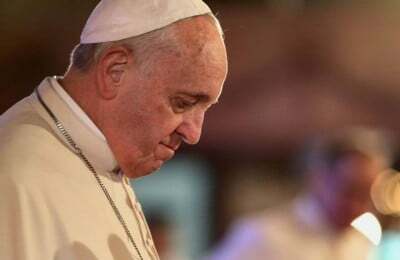 A member of the Palestinian Al-Fatah movement revolutionary council, Demetri Deliani, said the Jewish court has sent a letter to Pope Francis demanding he rescind or face trial on 20 September, and that he will be judged in absentia if he chooses to ignore the summons. The Vatican officially recognised the State of Palestine in February 2013. In June, the Holy See switched its diplomatic relations from the Palestinian Liberation Organisation to “the state of Palestine” in a treaty that constitutes the first legal document negotiated between the Holy See and the Palestinian state. Deliani said the Sanhedrin’s letter included many false claims about the history of Palestine and seeks to rob the Palestinian people of their natural rights in their homeland and to deny non-Jews of any rights. He warned that although the court does not have any legal status, it is troubling that this level of ideological extremism emerges from rabbis who have a significant impact on the Israeli government and its coalition parties. The letter was signed by the Secretariat of the Court of Mount Zion, including Rabbi Yoel Schwartz, Rabbi Dov Levanoni, Rabbi Israel Ariel, Rabbi Daniel Stavsky, Rabbi Yehuda Edri, and Rabbi Dov Meir Shtein. The Israeli government has not commented on the letter. Deliani called on the Vatican and Catholic churches around the world to intervene and put an end to Israeli “arrogance, racism and violations” against the Palestinian people and their land.